There are a lot of libraries in America – far more than there are McDonald’s restaurants. 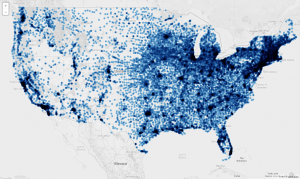 As part of the National Day of Civic Hacking, Justin Grimes, a statistician with the Institute of Museum and Library Services, created a map showing all (well, almost all) the libraries in the US. It’s a pretty impressive tool- you can zoom in and click on each individual library – and a great reminder of how important libraries are to American society.